There’s eggnog and pumpkin pie and turkey and ham and cookies oh my…Maintaining nutritious eating and a healthy lifestyle during the holidays can be quite a challenge for anyone. There are many parties and other social gatherings for work, family and friends. No one wants to miss these special occasions, so it is important to know ahead of time how to best handle all the temptations of eating, drinking and staying up later than we are accustomed to. Here are some ways to help you stay on course during this year’s holiday season. Get enough rest. Take a nap for even a half an hour before you go out, if you can. Getting enough sleep will help you to eat less and exercise more. Maintain your workout regime. If you can’t make it to the gym, plan a walk, run or some cardio at home. Try to schedule your workouts in the morning, to avoid casually dismissing them when the late-afternoon rush is upon you. Plus, you won’t feel as guilty when you indulge on a sweet or two. Think about what you will do before you arrive. Plan your eating behaviour. Limit the amount of drinks and sweets you’ll have. Eat some healthy snacks before you go so you aren’t hungry when you arrive. Drink lots of water. Have a couple of glasses before you go and alternate higher calorie drinks like alcoholic beverages, eggnog or hot chocolate with water while you are at the holiday party. Drinks can have a lot of hidden calories in them. Be aware of what you are putting on your plate if you are served buffet style. Take a small amount of everything you like so you will not feel deprived. Try to forego the bread baskets so you don’t fill up on too much carbohydrates. Fill your plate with some “good” foods first. Load up the plate with lean meats, vegetables and fruit. Watch out you don’t overdo it on the dips. Walk as often as you can. If you will be at someone’s home for an extended period of time, excuse yourself to go for a walk. Take a break from eating and get some fresh air. To keep healthy eating habits over the holidays make sure you eat several small meals a day. This old tip holds especially true during the holiday season. We tend to skip meals and indulge in one large holiday dinner with the entire family. Don’t starve yourself all day. Get some snacks in and most importantly start your day with a good healthy breakfast. 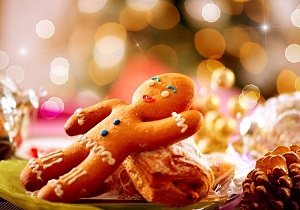 You will be able to enjoy your holiday more by stabilizing your blood sugar. Remember the importance of this time of year, friends, family and loved ones. Put your attention on spending quality time with those you love and engaging in fun activities. The holiday season does not have to revolve around eating.